“Never turn down a cigarette unless you know what you’re doing.” – a friend that has spent more than 20 years in China. Baskets of areca nut collected in my neighborhood. Some years ago I joined a photography club at my office – at lunch time, we would review each other’s photographs and those with a bit more experience would give advice. In a particular assignment, we were to go shoot portraits of strangers by simply walking up to them and asking if we could take a portrait. Also in my neighborhood. They’ll be distributed to people that will cut them into chunks that are the proper size to be wrapped. Before setting off to strike up conversations with Austin’s homeless, I bought a pack of cigarettes – I knew even from my two and a half decades until then that despite what the “red ribbon week1)“Red Ribbon Week” was a campaign run in elementary, middle, and high schools in my region of the US during the 1990’s when I was a kid. posters told us, smoking cigarettes was always a viable strategy for making friends. In the US, I drink whisky. In Mexico, I drink mescal and chomp on chapulinas2)Definitely my favorite of everything on this list. In El Salvador, it is “chaparro.” In China, it is baijiu and cigarettes. In Myanmar, I chew betel nut. Its just the right thing to do. 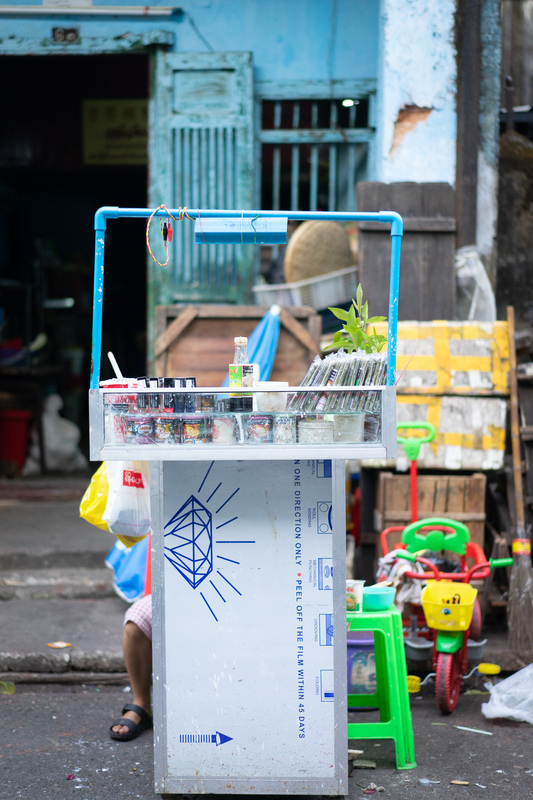 A betel stand in downtown Yangon. What I incorrectly called “betel nut” for a long time is technically arcea nut wrapped in betel leaf. 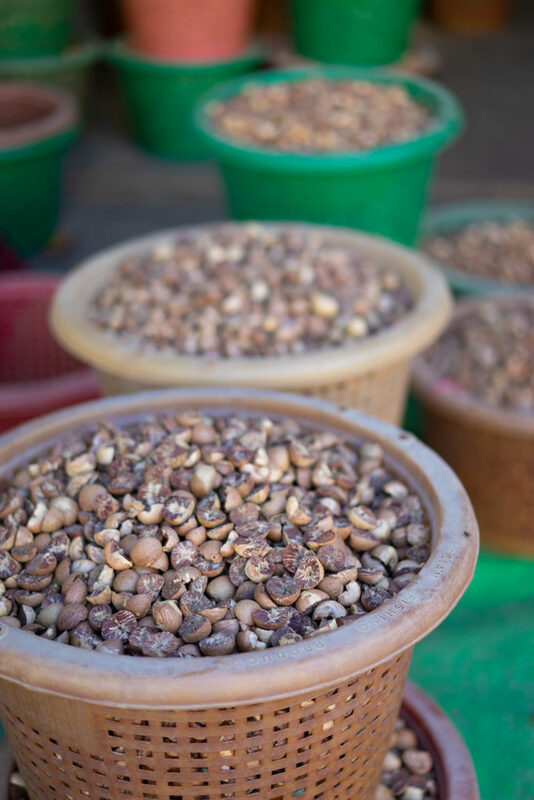 It is popular to chew in Myanmar and most of South East Asia. It is one of the first things you notice when you arrive in the country as your taxi driver cracks his door at every stoplight to spew a mouthful of bright read saliva onto the pavement. 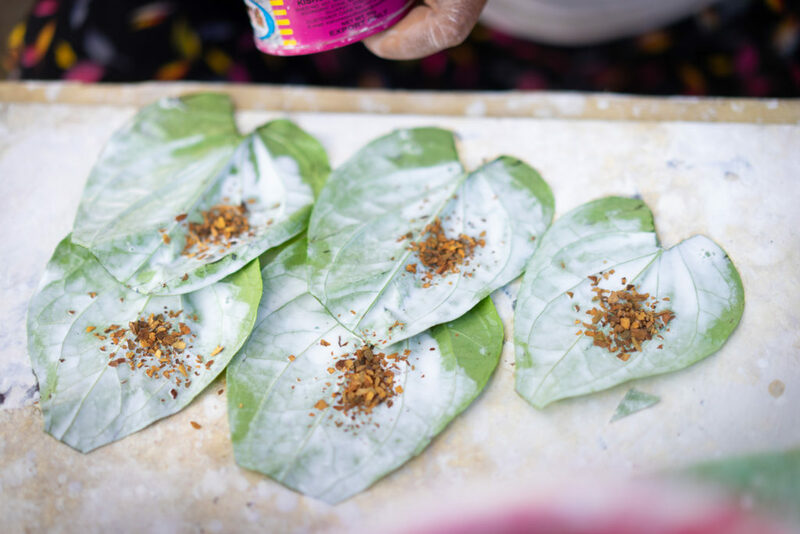 Most betel stands in Yangon will wrap a pouch to chew for you from scratch. 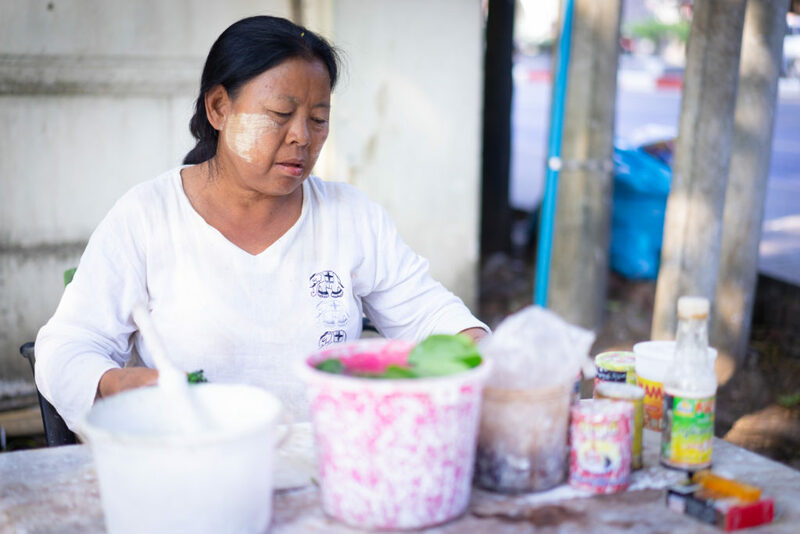 The streets of Yangon are covered in the red splatter-shaped stains of betel, it is hard to find a taxi driver – or anyone else for that matter – that doesn’t chew it. I received the first betel stains on my shoes from an old woman while sitting around a card table gambling with a group of people in my neighborhood one of my first weeks in the city. They always ask me whether I want “92” tobacco. I don’t really know what that means, so I just say yes. 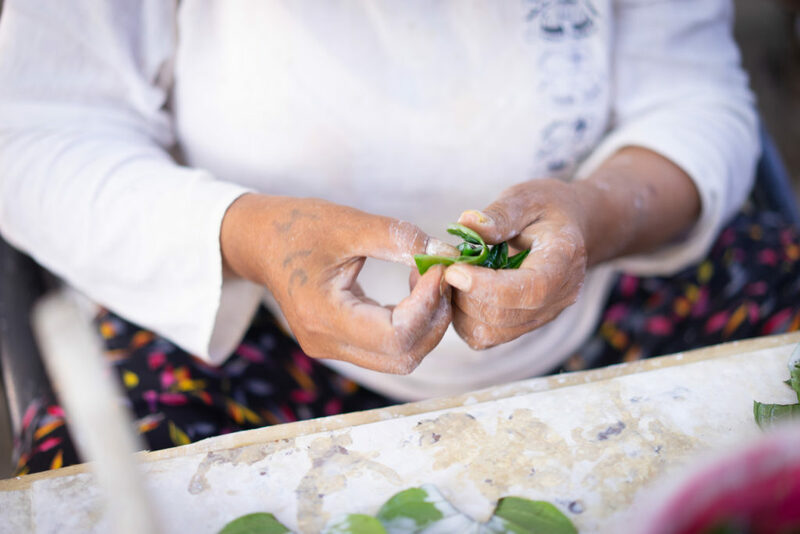 I didn’t actually try betel until I’d been living in Myanmar for about 6 months. 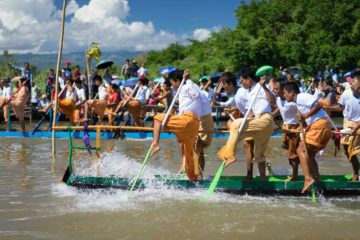 I knew that the look on my face when I first tried it would cause a lot of embarrassment, so I’d avoided it until a trip to Inle lake in Shan state. After taking a pretty informal “tofu tour” from a rather scrappy entrepreneur in a small village, he shared some with me and a friend I was traveling with. 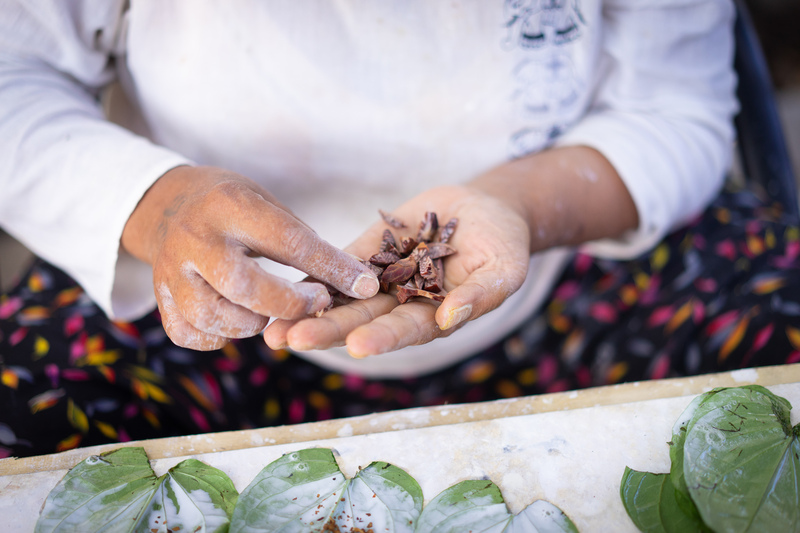 They spread the dried tobacco onto tobacco leaves with some lime. The taste itself is quite nice – the challenge is to not swallow (which can make you quite sick and also pretty loopy). I did manage to swallow a bit which gave me a bit of a head buzz that felt to me like an extremely mild hit of cocaine. 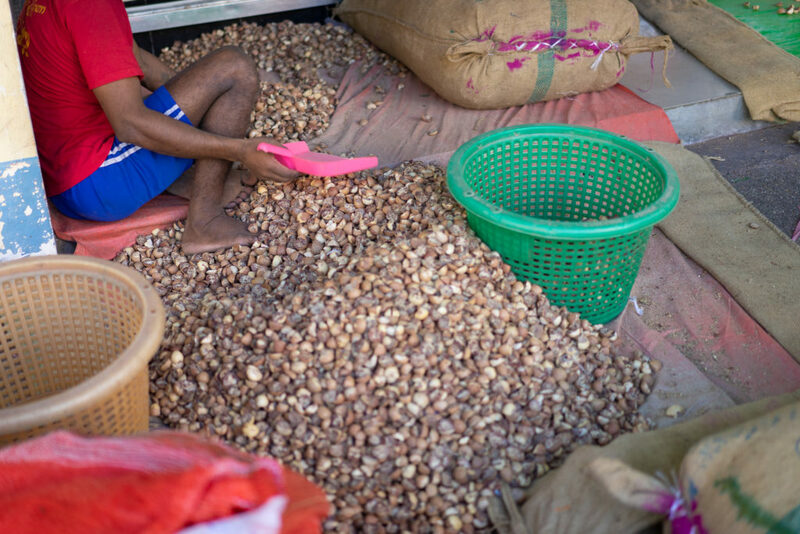 …next, they add the areca nut. I returned to Yangon with the goal of being able to chew betel without looking like an amateur. It didn’t take long. Yangon, to me, is a wonderful city for long walks, and betel is nice to chew while walking. You don’t have to talk to anyone, just most along over the hills, past the lake, the beautiful Shwedagon pagoda to the bustle of downtown, through the crowded streets, the Chinese temple, and down to the river toward the cargo ships with their enormous containers. Finally, they fold them into pouches that can be individually chewed. 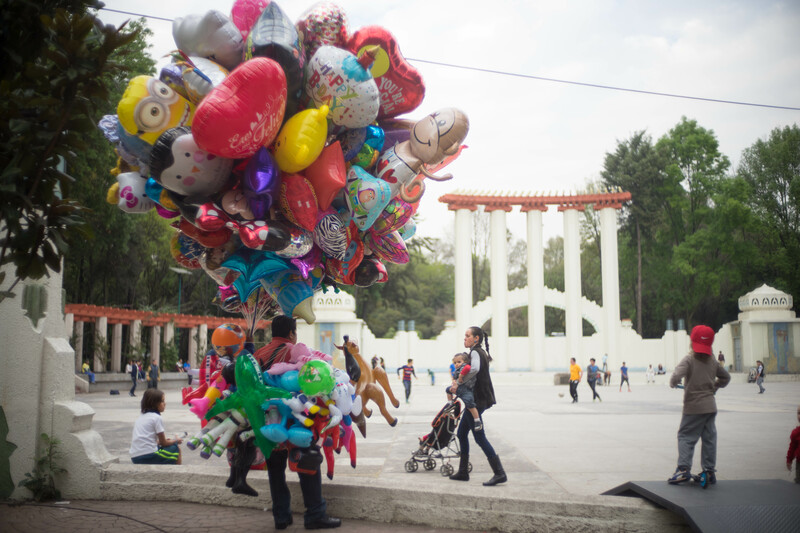 Locals will spew their bright red loogies anywhere, but I’m still a bit more coy – often trying to spit behind a dumpster, the grass if there is any, or into one of the numerous holes in the concrete. I seldom try to spit discretely, though – the locals seem to get a tremendous kick out of seeing a westerner chewing. 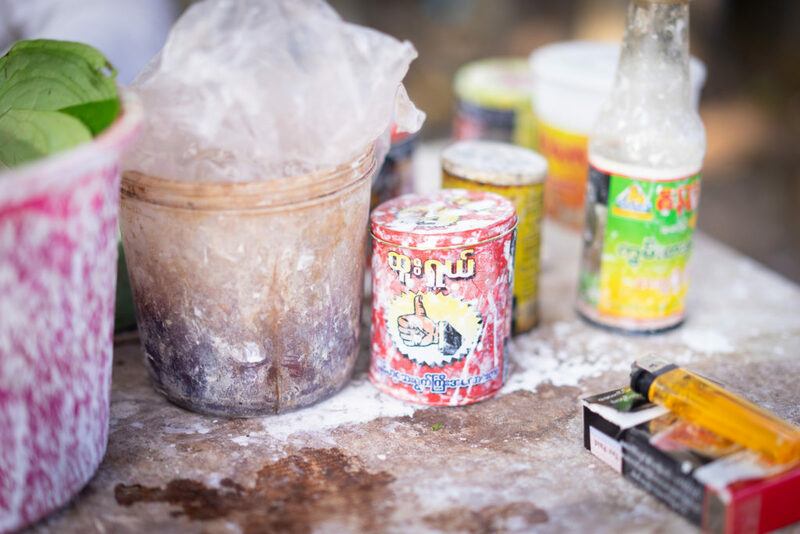 It is amazing to me how things like betel nut (coffee, alcohol, cigarettes…) always seem disgusting at the outset, but can so quickly loose the tinge in our minds and become appealing. 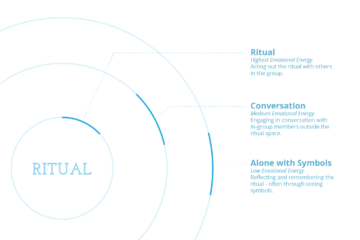 Something there must have to do with their addictive qualities, but also the rituals that we associate with them. I don’t miss baijiu, but I know that the moment I step off a plane in China again, it’ll just feel like the right thing. I don’t crave cigars except for when I know I am about to visit certain old friends and it just feels right. She posed for me after making me some. Not many westerners chew betel, so I may have been a bit of a novelty. …and I won’t live in Myanmar forever, so maybe it is alright to associate these particular long walks with bright red loogies. 1. ↑ “Red Ribbon Week” was a campaign run in elementary, middle, and high schools in my region of the US during the 1990’s when I was a kid. 2. ↑ Definitely my favorite of everything on this list.